Wroclaw's Copernicus Airport will complete its newest terminal in early 2012, boosting its annual capacity by 3 million passengers. Serving the usual airlines, charter flights, as well as budget carriers like Ryanair and Wizz, Copernicus Airport will most likely be your point of arrival in Wroclaw. You can drive directly from the airport to the stadium in about 15 minutes along the newly opened A8 motorway. If you prefer to travel via public transportation, head to the centre via bus no. 406, drop off your luggage at the hotel, and take a bus, tram, or train directly to the stadium. The central railway station in Wroclaw (Wroclaw Glowny in Polish) is currently undergoing extensive renovation and modernization, scheduled for completion in the second quarter of 2012. Travelling to the stadium from the central railway station is a breeze since the opening of the stadium's own dedicated station called Wroclaw Stadion. This means you can jump on a train from the central station and be at the stadium just three stops, or twelve minutes, later. However, by May 2012 there will be a much faster and easier connection to the stadium through a dedicated tram stop directly on the stadium's esplanade north side via tram number 31 PLUS. Along with the train, this will most likely be the most convenient way to reach the stadium. Like any urban centre, Wroclaw has its share of traffic, and for newcomers, driving around a new city can often be frustrating. This is why, if you are staying in the city centre, it would be much easier to skip renting a car and travel to and from the stadium via tram or train. But if you insist on car travel, it's worth knowing that route 94 is the easiest way to get to the stadium from the centre. If you'll be arriving from outside of Wroclaw by car, it's very likely you will arrive on the brand new A4 motorway. 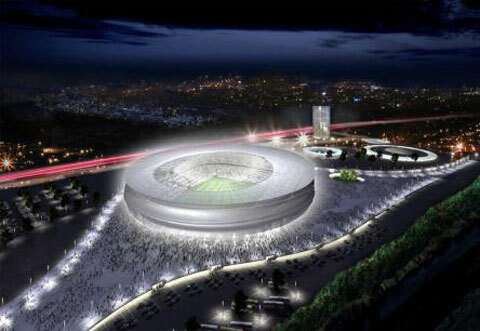 Transfer to the A8 motorway which encircles the city, and take the dedicated Wroclaw Stadion exit to arrive right at the stadium's doorstep. If you're coming to Wroclaw for Euro 2012, you'll no doubt have a million questions. Well a little research around Wroclaw Life will pay off dividends. We've got reviews and photos on all the best accommodation in Wroclaw, and you can even book hotels and apartments via our site. Tips on travel, airport info, and scores of insider reviews on the best bars and restaurants in town. With funky extras like our Polish language starter kit, weather reports and online map (with exact locations of all the city hotspots, including the stadium) you'll be fully equipped with all the info you need for a fantastic Euro 2012 campaign! For info on other host cities, go to our sister sites in Warsaw, Gdansk, Poznan, Krakow, Kiev and Lviv, or check out our individual articles about Euro 2012 Poland and Euro 2012 Ukraine. Been to Stadium. As good as Artists impression!! Wish you all the best Poland! Jamie above: how can you even compare the organisation of the EURO2012, based in Poland, currently 6th largest EU economy, with the Commonwealth Games in India...maybe it is time to start reading about the world first. I have seen the stadium already, it looks nice! Great games ahead in a great and stunning city indeed. I live here and enjoyable city but beware of shops that might overcharge for items. I was recently charged 5 times too much for tram tickets - shop was 3/4 Ruska Street. I didn't realize it until I was going home on the tram. :( Will definitely be more alert next time. We will beat you all! ;) never been here before but red a lot of good things about your city. We are looking forward to see it during Euro! This time we gonna make it! I believe in it! Wroclaw is beautiful I'm glad that we will be playing here! Gonna be awesome! Come on England! I hope Poland is better prepared for Euro 2012 than India for the Commonwealth Games! This looks good as an artist's impression - just hoping the real thing is not still a hole in the ground! any idea about he opening dates? I believe this will a great chance for the city. Hopefully you will be ready for it ;) Great event in a great city! Are you sure that that is a photo of the Olympic Stadium in Wroclaw ? It doesn't look like it to me.